Decision Coaching 3.0: How do you change a culture? The consulting firm Booz Allen Hamilton has published a wonderful collection of articles on culture titled, “Don’t Blame Your Culture: Instead, make the most of it for raising your company’s performance.“ Jon Katzenbach is one of the leading authors. 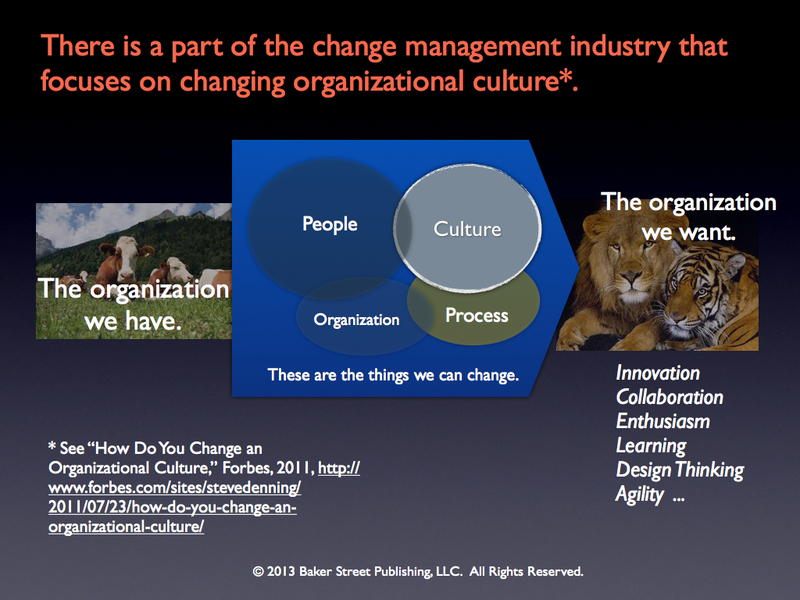 He is a respected 50 year veteran of the organizational change wars. See the video below. I recommend the collection to decision coaches. The collection is offered for mobile apps, e.g., iPhone, iPad, Android devices, etc. I’ve learned from experience that there are four levers that a CEO can work with to change an enterprise: the people, the organization chart, process, and culture. The organization chart is easy to change so we see lots of CEO’s try that. It is also relatively easy for a CEO to change people. Some CEO’s are even foolhardy enough to make a direct attack on culture. Most of these change efforts result more in frustration than profit improvement. The most effective, and sustainable, way to facilitate organizational change is to focus on improving business processes. Especially, key processes like R&D portfolio selection, product design and development, manufacturing, marketing and sales, and fulfillment strategy. If we get these processes right then the right culture and the right people will follow. Process is driven directly by business and customer needs. Culture and behavior follow process. 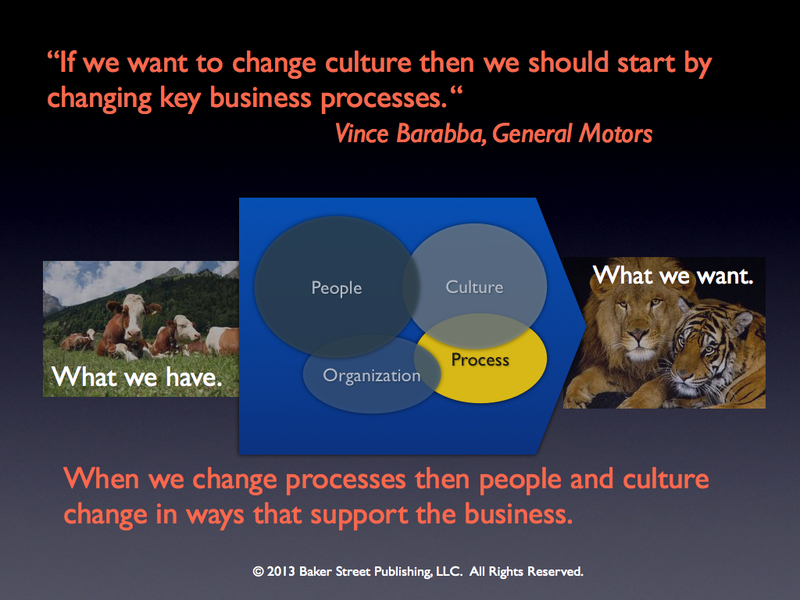 I learned the importance of process while working with Vince Barabba at General Motors in the 1990’s. Vince was brought in from outside GM to improve GM’s market research. He realized quickly that he couldn’t do good market research unless he knew what questions were relevant to the product design teams. This brought him into the center of GM’s product design. At the time GM’s product design process was broken. Vince and his team helped develop a new process that effectively integrated the “voice of the customer,” the “voice of the engineers,” and the “voice of management.” The current success of GM is due in large part to a focus on process improvements (in the Deming sense) at all levels. The “Emperor” of all processes is the process an enterprise uses to make strategic decisions — new products, new services, expansion into new geography, and things like major improvements in IT and CIT. How do we make sure the right people are involved when we are making strategic decisions? How do we listen to the “voice of the customer?” How are the needs of stakeholders merged with the knowledge of scientists and experts? How do we generate alternatives? What tools do we use to analyze options? Who brings it all together and facilitates mutual learning? How do we get real commitment? Where do we capture the lessons learned? 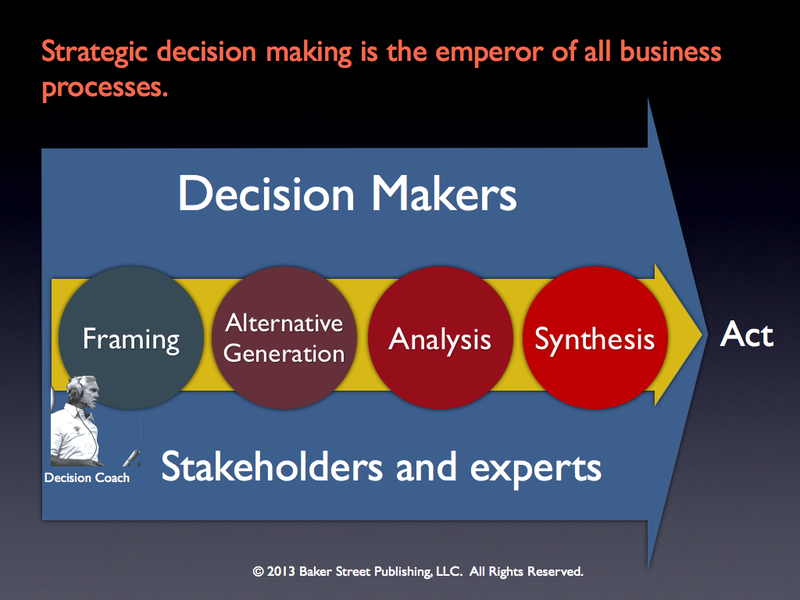 I recommend the Collaborative Design Process for strategic decision making. The Collaborative Design Process and the tools that go along with the process are the result of 40 years of decision consulting and coaching. It has its roots in the work of many organizations: the Management Science and Engineering Department at Stanford University, SRI International, Strategic Decisions Group (SDG), SmartOrg, Decisi0n Focus Incorportated (DFI), Applied Decision Analysis (ADA), Chevron, Boeing, General Motors, and many others. For an overview of the process with a case study see, Decision Coach’s Guide to the Collaborative Design Process. Baker Street posts about once per month on topics of interest to decision coaches. If you would like to receive these posts automatically by e-mail, just submit your address here.